A dive team searches in the La Brea Tar Pits Thursday June 6, 2013 as part of a police investigation. 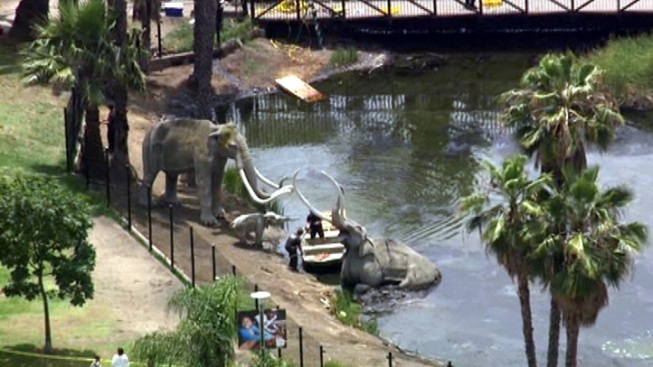 A police dive team searched the murky, oily water at the La Brea Tar Pits for a weapon Thursday as part of a homicide investigation. New information regarding a "old homicide case" led officers to the area, according to the Los Angeles Police Department. The search concluded about 1 p.m., and police would not say whether they found any potential evidence during the treacherous dive. Officers with the LAPD's gang homicide unit began the search at about 9 a.m. in the 5700 block of Wilshire Boulevard. Aerial video showed divers wearing protective wetsuits in the water and officers on a boat near the tar pit animal statues. The tar pits, one of LA's longtime landmarks, are a site where oil naturally seeps up from the ground. The fossils of the bones of animals that were trapped in the malodorous black goo have been excavated from the site over the past century. A tweet from the LAPD Wilshire Division account stated, "LAPD Underwater Dive Team in the area of La Brea Tarpits searching for evidence with Homicide Dets. Evidence is less than 65 mil years old."